Starting in May, we’ll go back to regular hours, closing at 7pm on Friday & Saturday nights. In the month of April, Sidestreet Arts will be featuring the art of Mini Giri and Charles Gluskoter. 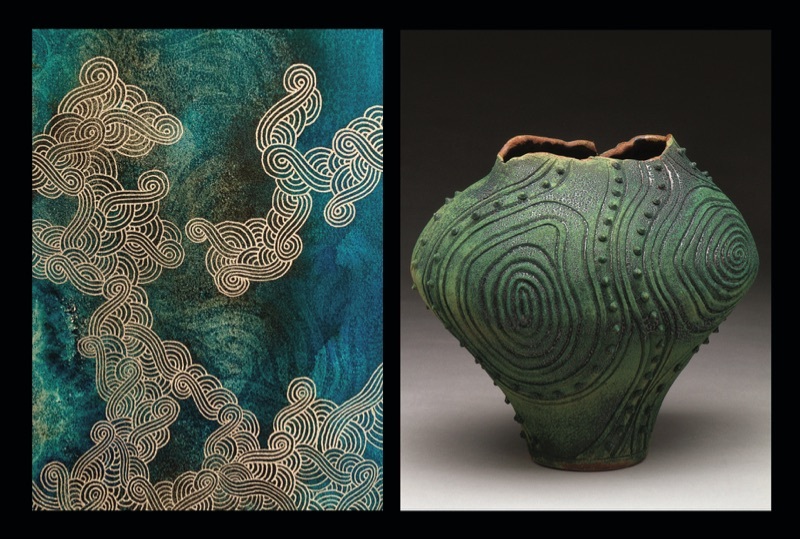 Mini Giri’s intricate and intoxicating line-work swirls all over textured warm wood panels while the ceramic vessels of Charles Gluskoter harken back to those of an ancient civilization. 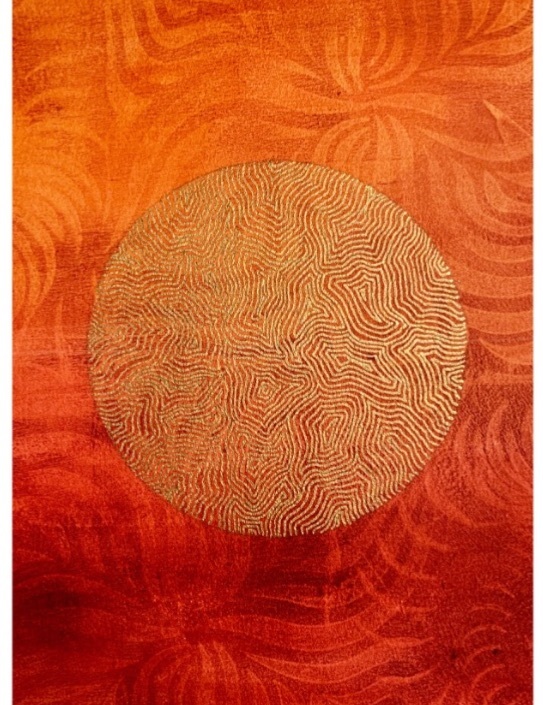 Both artists reference multi-cultural influences. 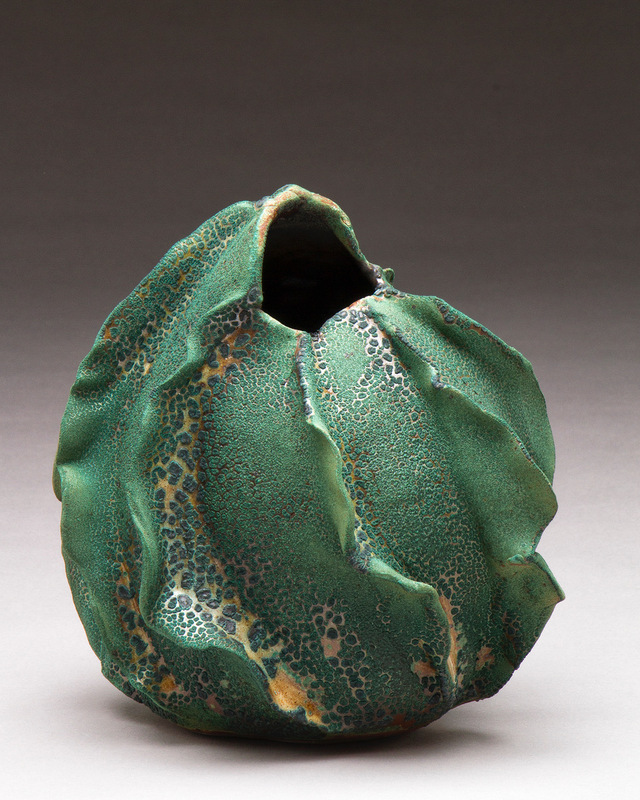 And while Mini’s overlapping twirling lines project outward from deep seas of colored backgrounds, Charles’ lines are carved into his thrown and textured hand-built stoneware pottery. Friday, April 5th, 2019, and the first Friday of each month we'll be open til 9:00 pm with snacks, beer and wine. 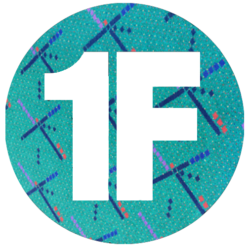 Join member and represented artists in the gallery, and be sure to visit our neighbors Wolff Gallery and Stark Street Studios on your Art Walk About. 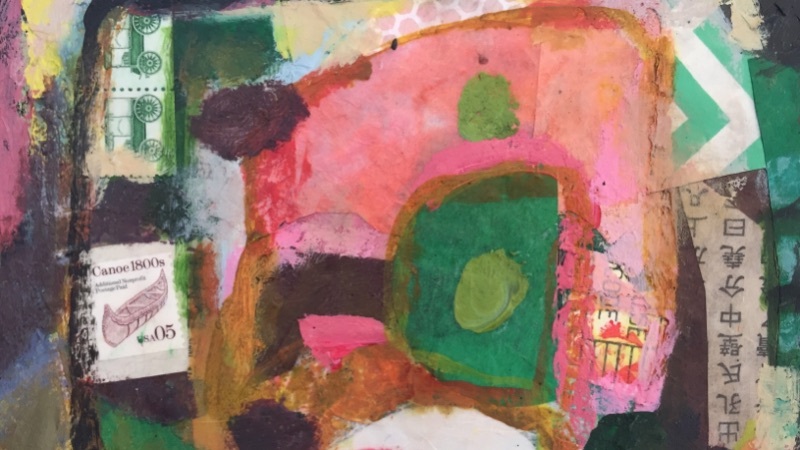 some adult beverages, nibble some brunch time snacks and learn more about how our member artists do what they do. We'll have a special gift for the first dozen visitors, as we like to do. This event is free (though you do have to be 21 or over to enjoy the adult beverages). Non-alcoholic refreshments will also be available for those who prefer it. Our May show will feature flowery and botanical paintings and ceramic sculpture by member and guest artists. 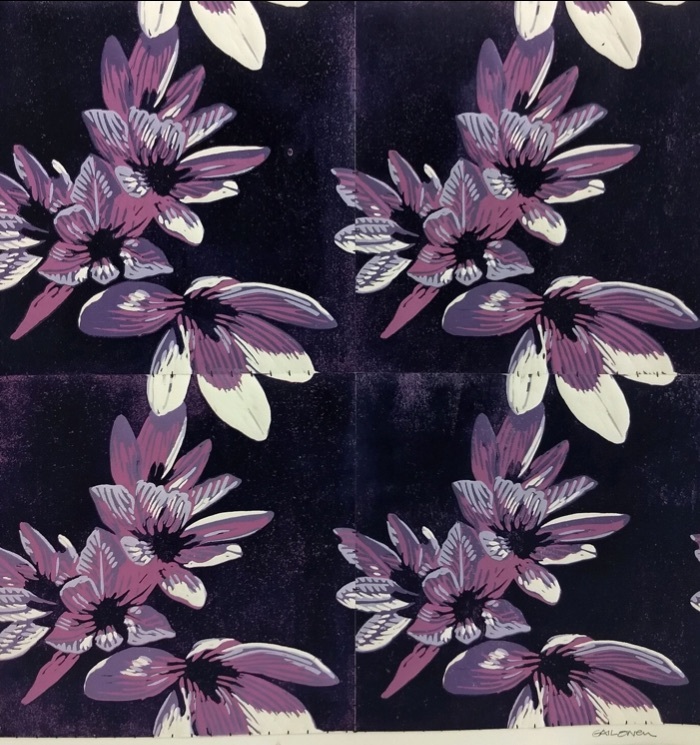 Come see what’s blooming on our walls. We have added a few new artists to our card wall. 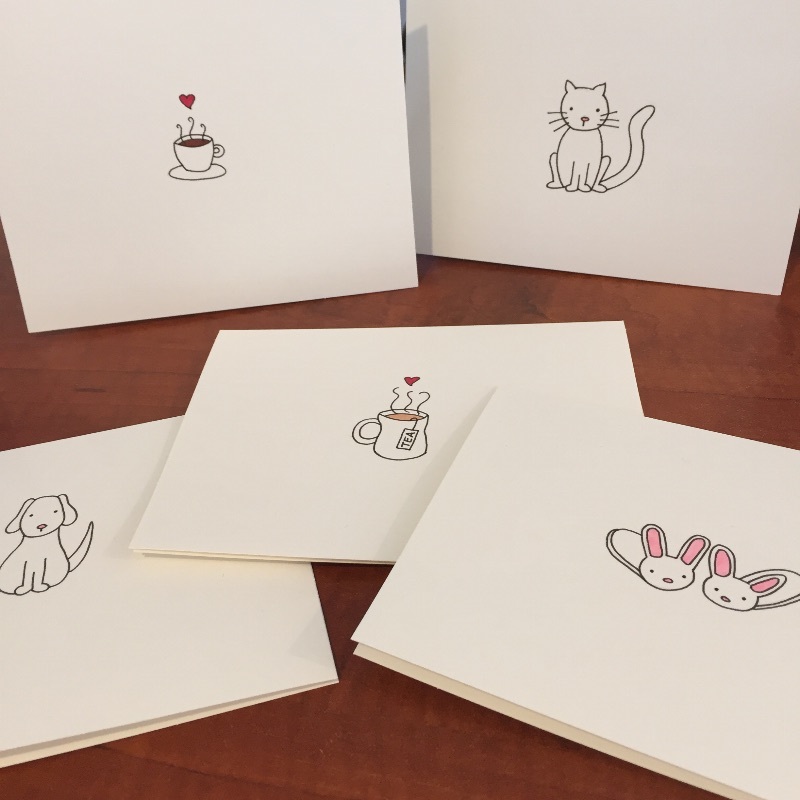 Marieke Mertz, of Presents of Love, hand draws charming little kitties, puppies and cups of tea n’ coffee on her greeting cards. 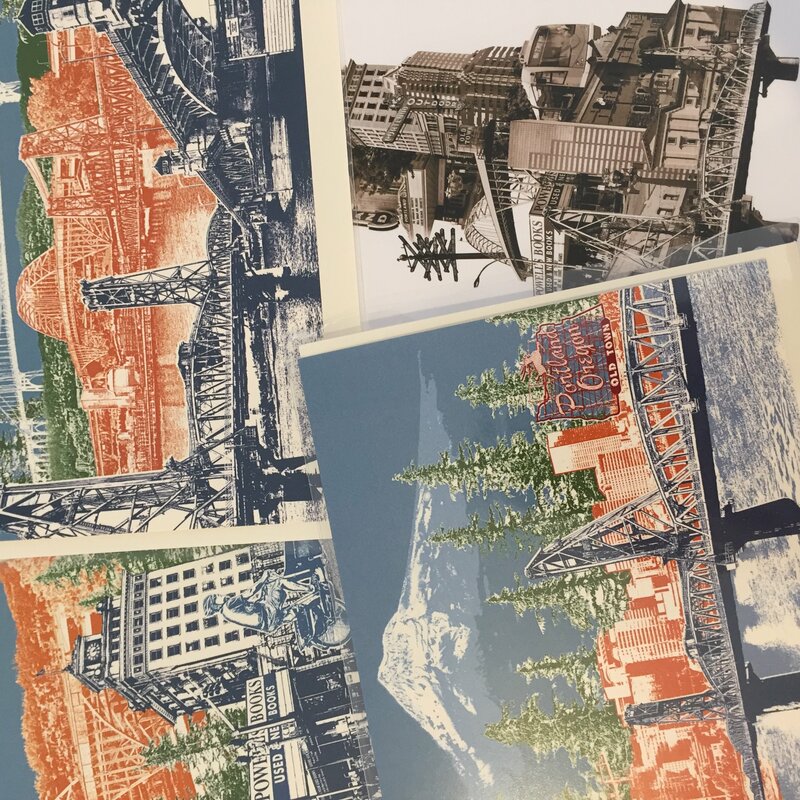 And Beth Kerschen has captured Portland’s bridges and local icons in her line of greeting cards, postcards and prints. Also new to our Small Works Gallery is multi-media/reclaimed wood and found-item artist, Minal Mistry. 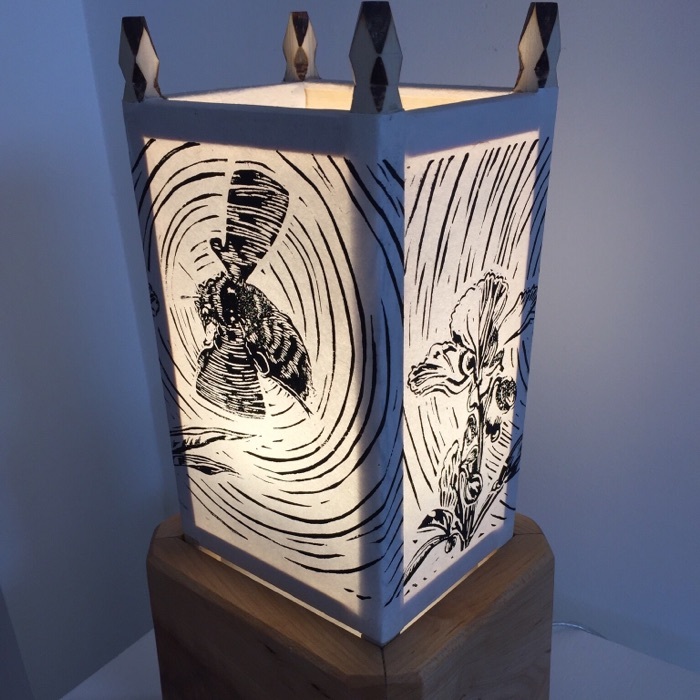 His linoleum-cut design, paper and reclaimed wood lamps are brightening up the gallery... and his wood benches are sitting pretty, too. I’d found myself out long after dark. It was one of those evenings in early Spring where you just didn’t want the day to end. The park kids had already been dragged home by their parents, the street lights had come on, but I still had some walk in me. I strolled towards the community garden along the path through the park. That’s when I saw him ... against the rising full moon... the largest Great Horned Owl I’d ever seen. He looked straight at me with his massive yellow eyes. I froze, not knowing exactly what to do; we just stared at one another. 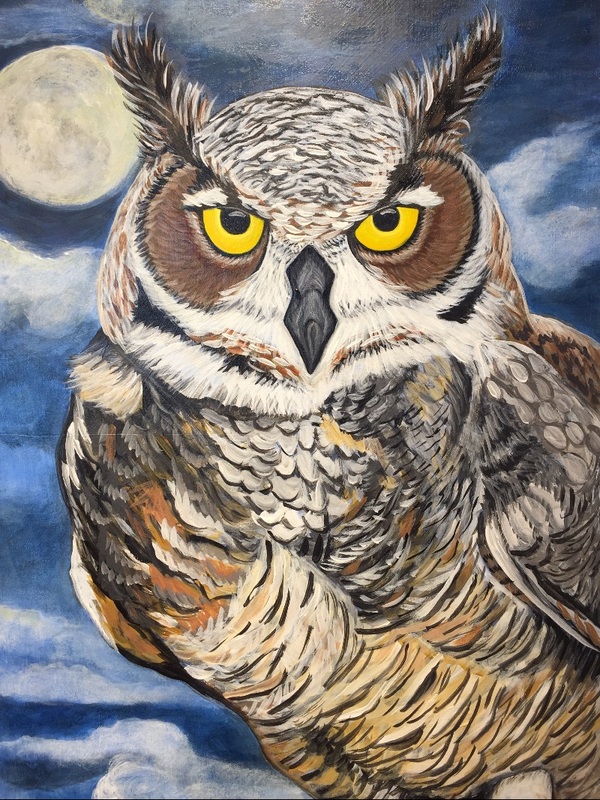 And then, with a hint of what seemed like disapproval, the great owl fluttered his wings and cocked his head as if to say, “How come you’re out so late?” I, of course, had no answer. Copyright © 2019 Sidestreet Arts, All rights reserved.